Every year Second Life Residents from all over the grid, create wonderful Bandanas for Bandana Day which is the last day of Hair Fair. 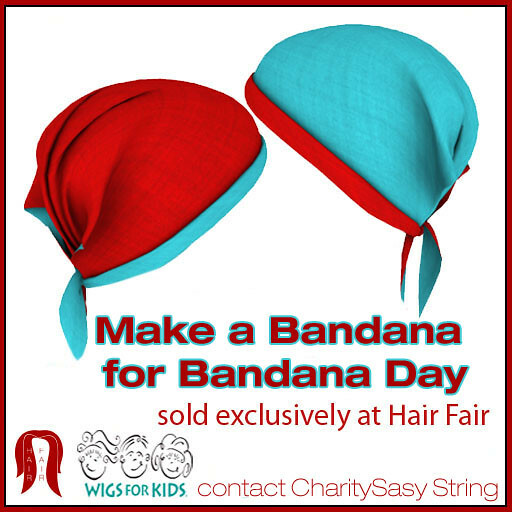 On Bandana Day we remove our hair to show we care, for those that suffer hair loss due to illness or disease. We provide the full perms kits for this, and collect the creations made, then they are sold by us exclusively at Hair Fair during the event, and all money raised goes to our donation total for Wigs for Kids.